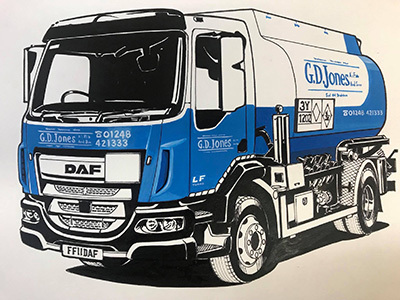 G D Jones & Son is an independent family run fuel oil distribution business situated in North Wales supplying Heating Oil, Agricultural and Commercial Fuel Oils to Anglesey and the surrounding areas of Bangor, Llanberis, Caernarfon, Penygroes, Lleyn Peninsula, Porthmadog, Llanrwst, Betws y Coed, Colwyn Bay, Conwy and Llandudno. Our aim is to meet the needs of each of our customers by providing a fast and reliable service, whether a large company or a family dwelling, by offering next day deliveries, and if possible, a same day service to those customers who have or are about to run out of fuel. We believe that these core principles are the main reasons for the success of the company over the past forty years and that continuing to uphold them will ensure we can succeed in meeting the demands of our customers in the future. Create a username and password to access the site. Fill in your billing and delivery information or just your account number and post code if you're an existing customer. Obtain a live online quote based on your delivery address. Either pay by credit or debit card using a secure server or pay using an existing direct debit agreement or on account for approved customers.